If you've ever played Leopard Spots at a land-based casino they you'll like playing Reel Strike. You can wager from 1 cent to 50 cents up to 10 coins on each of the 15 pay-lines. 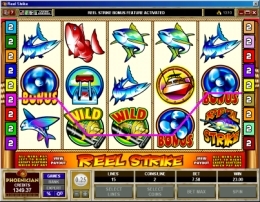 Similar to the theme behind Leopard Spots, the 5 reels consist of colorful fish, blue sharks, boat items and spinning propellers that trigger the bonus round. A wild symbol substitutes for all symbols including the bonus symbols except for the 5 scatter symbols.To get a bonus round 5 propeller bonus symbols or a combination of wild and propeller bonus symbols must stop on a covered pay-line. In the bonus round feature you pick 1 from 6 racing boats to reveal the number of free spins you'll get. Pick the right boat and you can win a maximum of 7 free spins, a bad pick gets you just 2 free spins. After that you pick a boat again to reveal your multiplier. The multiplier ranges from 1 times your wager to 6 times your wager. The bonus round is not retriggered during the free spins. However, you win something on every spin even if no winning combinations stop on a pay-line. Cover all lines in this game as the bonus symbols stop on the diagonal pay-lines much more often than straight across. All Slots has over 400 fun casino games. Choose from a variety of 1, 3 and 5 reel bonus slots, video poker, table games and 19 progressive Jackpots. Get 100% matching bonus up to $200 and get 10% on each deposit up to $450 every month. That's $5000 a year in free bonus cash! All Slots accepts all Canadian and most International players. They have casinos available in French, Dutch, Italian and Spanish. Deposit using a variety of methods including Visa, Mastercard and a variety of ewallets. Slot payout is around 95.59% while overall casino payout is 96.46%. Player Tips: After you make your first deposit make sure you enter your account number to claim the bonus cash. It took about 10-15 minutes to get the free bonus cash. You're automatically entered into their loyalty program where each wager accumulates free bonus credits. We have success playing both Reel Strike and Tomb Raider. An All Slots flash version of both games is available on our Free Microgaming Slots page. All Jackpots Casino is another property managed by the All Slots team and is also highly recommended. Both All Slots and All Jackpots are eCogra approved casinos.